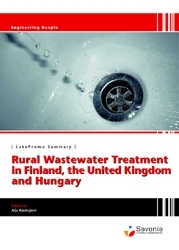 This summary consists of three country-specific parts, it provides an overview about rural wastewater treatment in Finland, the United Kingdom and Hungary. The report from Finland has been compiled in cooperation with Savonia University of Applied Sciences ant The City of Kuopio. The University of Brighton has prepared the UK part and the University of Debrecen is responsible for the Hungarian part. This publication was collated as a part of the international EU-project (Interreg IIIC Programme) called "Lakepromo - Tools for Water Management and Restoration Processes (2004 - 2007), which aims to promote multilevel and interregional co-operation and exchange of experiences in the field of water and wastewater management.